Petals And Thorns is an American musical duo, formed in 2009 in Cleveland, Ohio. The duo is a female/male studio collaboration between vocalist Mia Petals and multi-instrumentalist/producer Johnny Thorns. Combining sometimes fragile, yet sometimes cabaret, and other times angelic female vocals against gritty guitars, haunting synths, and delicate piano sounds; they create what comes across as darkwave/electronic/rock with a touch of metal. They have gone on to release their debut album "The Broken Mirror" with progress already in the making towards newer material. The duo together took the time to discuss this release and their assortment of videos to accompany it. Mia: Darkwave / industrial / electronic rock / gothic rock. Johnny: With a touch of metal. And a chick singer. Johnny: Well... It's a strange story, actually. We met in high school through friends of friends, and then went our separate ways after graduation. Some years later, about 2008, I had been writing the beginnings of what became "The Broken Mirror" and had tried out a few different singers. Then I saw Mia's profile on the old MySpace. I didn't recognize her at first, but her profile said she wanted to be a singer and she stated her influences. Her influences were right in line with what I had in mind, unlike the previous singers I had tried to work with. She had her MySpace profile set privately, so I had to ask a mutual friend to send her a message. That's when she responded with a message to me saying "hey I remember you from high school, you were quite the musician" and that was pretty much that. Mia: During our first two years together we lived in an apartment building. We began really focusing on writing and recording once we moved into our house. Johnny turned one of the rooms in our basement into a studio. 2011 is when we started releasing demos on the internet. 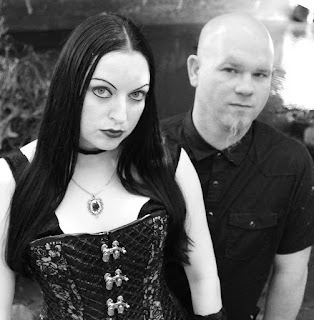 Because of the demos we ended up crossing paths with the well known goth darkwave band "Lestat" and we opened a few shows for them, over the course of couple years. We were still writing more songs, though. The whole album ended up finished and finalized last year. 3. Why did you want to go and call yourselves Petals And Thorns? What type of petals and thorns, what colors are they? Mia: We wanted to name our band something that holds balance of the opposites. We thought petals and thorns was perfect because they are opposites but are also part of the same entity. We feel it represents us metaphorically and what we bring into the music. Rose petals. I like red, black, purple, and white. Johnny: We are a sort of yin and yang to each other, but in a very complimenting way. And the thorns are bloody. Mia: I have a vast amount of musical influences spanning many genres and time eras. I grew up with musicians for parents, and I played flute while growing up. Some of the most influential music for me includes: Beethoven, The Beatles, The Doors, Mary Fahl, Loreena McKinnet, Tori Amos, Garbage, Depeche Mode, Soundgarden, A Perfect Circle, Delerium, Switchblade Symphony, Julee Cruise etc... My non-musical influences are: surrealism, science fiction, the paranormal, metaphysics, and humanitarianism. Johnny: We both write our songs. I write the music and she writes the vocals and lyrics. Mia: I am usually inspired by Johnny's musical ideas to write melodies. I keep journals of many songwriting ideas, poetry, and prose. I like to write subject matter that is deep. I steer away from typical songs about finding love or a broken heart. I prefer to write songs about topics that challenge the mind and emotions with the intention to help others deal with dark matters. Topics such as: facing your fears, abuse, the supernatural, suicide, self-transformation, dreams/nightmares, revealing corruption, and death. 6. Why did you want to go and release a video for all 8 songs off your debut album "The Broken Mirror"? Johnny: Well, video killed the radio star a long time ago. It just seemed like the logical thing to do. People take music for granted anymore, we've become such a visual species. Just releasing an album out into the world isn't good enough these days. I have a little bit of a photography background so we just decided hey let's do it like this. Traveling and touring, the ultimate goal of any musician, feels very far away for us, but shooting videos is something we can do without having to have support from people in the form of money. It's the best thing we could think of doing to get the word out there to the world that we exist. Mia: Making videos for our songs is a great way to tell the meaning behind the songs visually. It opens up the creative expression to connect visual movement with music. It's a lot of fun making videos for our songs and likewise a lot of work. It is well worth it though. 7. Would you consider doing that sort of thing again or you just think it will work for your debut album? Johnny: We love making music videos and we will continue to make as many as we possibly can. It's become an addiction for us both I think. Mia: Yes I agree, we will continue making music videos. 8. Out of the 8 songs and video companions, which is your favorite and why? Mia: So far it's Smiling In The Broken Mirror. I enjoyed the months of preparation. Painting and setting up the props was a lot of fun. Johnny: For me it was "Method to the Madness". That was the first video, but it was the last song that we wrote, and probably my favorite. After we shot it and released it, and saw it was received well by the online community we realized "hey we CAN do this ourselves". It was the catalyst for our motivation to do them all in a way. I have to agree with Mia though, that our most recent video was the most fun. We spent a lot of time working together prepping it, more than any of the other videos. It gave us a lot of time to talk and bond and listen to music while we worked together. Most couples are on a couch in front of a tv, or doing separate things, and here we are designing a video set for two months as our way of "hanging out together". By the end, we both pretty much came to the conclusion that "Petals And Thorns" is this thing that we will always do, no matter what. It was really cool. 9. Do you think you may re-release "The Broken Mirror" to include a bonus disc of a DVD with all the videos and then the CD of the album itself? Johnny: That was definitely the initial goal, however, a physical release would have to be on bluray because all of the videos are 1080p HD. Blurays cost significantly more to make than DVDs and we just don't have that kind of money at this time. People don't really seem to buy physical media much anymore so it would be a pretty risky investment. Maybe down the road we will physically release the videos along with more from the next album and/or some live footage but for now, it will just be a YouTube thing. 10. Have you gone on to write any new material for a follow-up? Johnny: We have a decent handful of developing songs that are well into the "started" phase. We've both learned a tremendous amount about music and production through the journey that has been our debut album. We're definitely at the point where the new things that we are coming up with feel right. It's an exciting feeling to start into a second album after what was the very extended process of writing and putting together our debut. It'll be a nice fresh start for the sound and production end of it, and a more focused effort musically now that we have a clearer view of what it is we are and what we want to do next. Mia: We have started a few ideas with music and melodies over the past couple of months. We plan on writing intensely when we finish our music videos which should be during November 2015. 11. How do you think this new material compares, differs, or has evolved from your previous works? Johnny: The ideas we have so far feel bigger and tighter. The melodies that Mia has been coming up with are absolutely delicious! I'm really proud of her! One night, we were listening to some playback of one of the tracks, and we just looked at each other, there was this mutual feeling of "wow this feels very right" but without the actual words. 12. Do you play live as well? What are the plans for shows and touring? Johnny: Yes, we play live. We've performed a number of times locally over the past few years. There's not a lot of good opportunities for us, or our kind of music, in our hometown of Cleveland, so we're trying to focus on shows in other areas and states in the northeast. We've been offered to hit the road to tour a couple of times, but touring openers generally don't get paid, so the real trick is: how do you quit your job to tour, making no money, and find a way to pay your bills back home without having a job to come back to? We'd certainly like to get to that point someday, the real question is, how do you know when you get there? Johnny: We'll be finishing the last two videos within the next month or so, at which point we plan to present the whole thing on one "album" video on YouTube. Once the video album is all said and done, we plan to immediately go back to writing. We're really excited, but we wanted to finish the videos project first so that we weren't juggling too much at once. Also, some friends in another city have invited us to perform with them at a New Year's Eve concert this year, we're pretty excited about that. It's one of those situations where you meet someone and become friends online and then you eventually meet up years later. They're really good people so it's going to be very cool! Mia: Halloween of 2016, we're hoping to have the next album ready. 14. 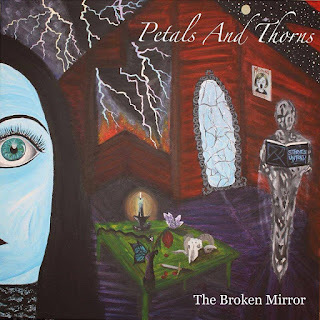 Have you heard of Petals And Thorns? Johnny: Most people have probably not. We have, though. Mia: Yes, and thank you so much for the interview, Natalie!